Do you like chicken? Chicken is one of my family’s favorite kind of meat. What is great about chicken is that the recipes for it are endless. 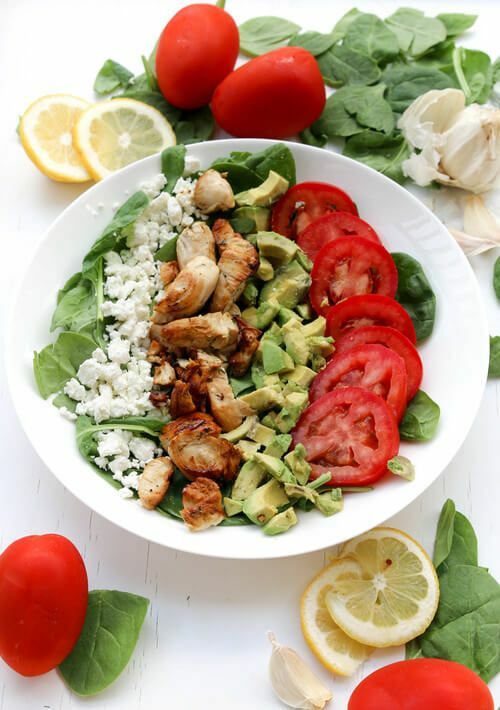 Try incorporating more chicken into your diet by adding chicken into a salad like this one. Lemon herb garlic chicken salad makes a great lunch. Also, if you are looking for a lean, low-fat protein, chicken is a great choice! Chicken helps build muscles. It contains more amount of protein than it does fat. But the benefits of this salad don't end there. The avocado enhances skin health and also nourishes skin. It also packs in a lot of fiber. And if we mention spinach, this super-green is low in calories but high in nutrients. Along with that, spinach can help prevent cardiovascular diseases. Cut 1 boneless- skinless chicken breast into bite size pieces. In a small bowl, combine 1 stem chopped fresh basil, 1 stem chopped fresh dill, juice from 1/2 lemon, a pinch of salt, a pinch of ground black pepper and 1 minced garlic clove. Give it a good whisk and add to the chicken. Marinate chicken for 5 minutes. Add chicken with marinade into the hot skillet. Sauté chicken for 10 minutes (or until cooked all the way). Arrange 1/2 cup spinach, 1 Tablespoon crumbled feta cheese, 1 sliced plum tomato and 1 chopped avocado on a plate.